Buy West Himalayan Birch Tree (Betula utilis var. jacquemontii) Online from UK tree supplier. These generally grow a little slower and smaller than their single stem counter parts. A very common description of the West Himalayan Birch tree is that it is very striking. This doesn't come from people standing too close to low branches in windy weather but from people who appreciate a good looking tree. West Himalayan Birch Jacquemontii is very distinctive because of its bright smooth, white bark and dark green leaves, which turn a golden yellow in autumn. It is this contrast that makes this Birch tree stand out. 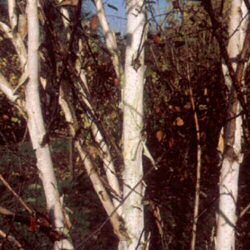 Some birch tree owners have been known to use a jet wash or sponge to clean up the bark. The white bark takes a few years to come through so you will have to settle for the coppery brown bark until then. This is not true if you are a connoisseur of coppery brown bark, you will then be ecstatic for the first few years and less so as it fades to white. Either way, we can guarantee you are going to be happy with some of the bark, some of the time. If you would like to see much more bark then you need to buy much more trees but that comes from us wanting to increase sales not satisfy your desire for bark. Planting in front of evergreen trees will give you a striking contrast in your garden in Autumn and Winter. The stress relief mentioned in the product title comes from peeling the old bark off to reveal the new bark underneath. We are not suggesting this is a replacement therapy for PTSD or Post Natal Depression but if you have had a crappy day at the office then a few peelings of this may help. There are male and female catkins on the tree. Male catkins are yellow and droop with the female being green and a little more upright. They appear May to July time and turn to "winged nutlets" around September. A graceful tree that is perfectly suited for smaller gardens. It can be grown as a specimen in the lawn, grown as a group of trees in a woodland or just in the border somewhere. West Himalayan Birch trees are tolerant of wet sites and occasional droughts so if you are a forgetful gardener that lives in parts of UK with very unpredictable weather, this tree is for you. The growth rate is somewhere between average and above average but in the right conditions should be closer to above average. This usually means more than 30cm a year. 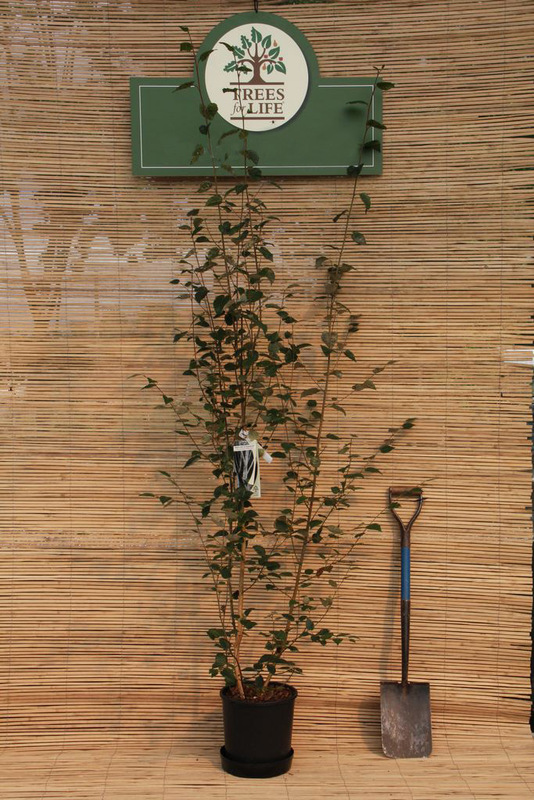 This tree is supplied at a height of 1.2 to 2.6 metres in a 5-20 litre container for year round planting and better results than from either bare-root or containerised stock. Expect a final height of around 6m at the 10 year point but could go on to grow more depending on local conditions. West Himalayan Birch Betula Jacquemontii final height could be as much as 18 metres at maturity but a lot depends on local conditions e.g soil, weather, low flying helicopters and pruning massacres. If it gets too tall then manual pruning is an option. Width should be around 4 to 8 metres but again manual pruning will give you what you want. That being said, only prune if you have to as West Himalayan Birch generally prefer to be left alone. The pruning sense we mean, not socialising; by all means make two cups of tea when you go out to bond with your tree. All dead, diseased and crossing branches should be pruned out for the longer term health of the tree and all pruning where possible should be completed in late Summer to Mid-Winter as the tree "bleeds" sap profusely. At the time of writing the RHS advise against the use of binding, covering or painting the wound as it traps moisture and could lead to a fungal infection. Leave to air dry instead. Excessive loss of sap would be noticed by lack of vigour and die back. If you come home one day and the Tree Police have taped off your birch tree and stood around looking confused then your tree has died in mysterious circumstances. If you decide to replace your West Himalayan Birch tree without knowing the cause of death then we suggest finding a new spot for it if at all possible. This is to minimise the risk of something being in the soil that caused you a problem. If however you notice out the corner of your eye an out of place JCB with wide tyre tracks leading to your prized Betula Jacquemontii then we think it safe to buy another tree from us online and plant in the same place. West Himalayan Birch is listed as being a H7 in frost hardiness terms which means it can go down to minus 20 degrees centigrade. When choosing a spot for your Birch tree go for full sun and sheltered. It will tolerate partial shade but you will get better results in full sun. Although the tree is listed as drought and wet tolerant, prolonged standing water could become a problem. The best way to plant this Birch tree is to get someone else to do it. Second best way is to learn telekinesis. Failing that plant in a moist but well draining soil. West Himalayan Birch Betula Jacquemontii is tolerant of most soil conditions including sand, chalk, clay and loam. Acid to neutral soils are also tolerated. It seems the only place you cannot plant this Birch tree is in shallow chalk and your attic . It is for these reasons Betula Jacquemontii is easy to grow. Dig the hole at least 25% wider and deeper than the pot it comes in as this makes it easier for the roots to spread. If you suspect your soil is of poor quality e.g clay then mix the excavated soil 50:50 with well rotted manure or compost. Adding bone meal could give the tree a boost. Tease the smaller roots out that have started to grow around the outside of the root ball. Do this extra carefully if outside of the dormant season e.g. Spring and Summer. Place a small amount of soil back in the hole so that when you place the tree in, the top of the root ball will be level with the ground. Half fill the hole and gently firm the soil with your foot. Fill the hole completely and firm again. Water with at least 20 litres and keep watered for the next week or so, especially in Summer. All being well you might hear your West Himalayan Birch tree give a slight sigh of relief as it settles into its new home or it is your muscles complaining of hard labour. Himalayan Birch trees are shallow rooted trees so in exposed sites, you might want to consider staking. The stake will need to be placed "up wind" of the tree if using a single stake and in the UK the prevailing winds are from the South West. If you are using two stakes opposed from each other (in location not political views) then still a good idea to have one of them up wind. If you have more than one West Himalayan Birch tree and want to plant an avenue or copse then you need to plant them so their branches will not touch each other especially in high winds because this could cause damage to the tree and let disease in. As the width of the tree could be up to 8 metres, to be absolutely safe go for that spacing. The Royal Institute for Chartered Surveyors state "It must be noted that in most cases trees located close to buildings will not cause any damage. There is guidance on sensible tree planting distances which is mainly related to trees growing on shrinkable clay soils. Planting distances on other soil types are likely to be different. It is also worth pointing out that some experts argue that these distance tables are too conservative." For Birch trees the tables suggest a minimum planting distance of 4m away from the building which is to cover worse case scenario which would be very heavy clay soil with shallow foundations. Houses built before 1980's have a higher risk of having shallower foundations. The two problems are from large roots applying pressure to a structure and small roots taking water out of the clay soil with the former being considerably less of a problem than the latter. Large roots for a Birch are roughly within the first 1m and even then are extremely unlikely to be strong enough to cause problems with foundations, more likely paving slabs and old clay drains. Secondly are the smaller roots which takes out water from clay soil causing it to contract which may cause your foundations to shift. Evidence of this is usually small cracks around window and door frames. If you don't have clay soil and your foundations are deep and on rock/sandstone etc, it seems you are extremely low risk. As you can see, each case is individual and dependent upon lots of variables. If you do suspect your West Himalayan Birch tree of causing foundations issues, one thing you can do to reduce the amount of water taken from the soil is to prune the tree back reduce the crown by 70% according the the RHS) as this reduces the water requirements from the roots. Preferably prune late Summer to Mid Winter. Discovered by David Don in Nepal in 1841. This means it was 6.41 pm in Nepal at the time of discovery or it was the year 1841. Most likely discovered in the wild and not as David was walking round a Nepalese tree shop. The bark has previously been and still is used as paper. This is more for ceremonial use rather than photocopier refills. There are oils in the bark which severely slows down the decomposition process and before any one asks, no you should not spread it over your gran when she is asleep to get a few more birthdays out of her. It is also easy to set fire to so a very useful addition to your kindling pile and the wood will burn even when wet. We should emphasise wet and not submerged as we do have some customers that test our claims. West Himalayan birch trees are considered a pioneer species which means it performs very well in areas where other trees did not, or out grows/performs other trees when the land has been cleared. Average life span for most birch trees is 40-50 years but some have been known to live for over 200. If 40-50 years does not feel like good value for money then try measuring the life span of your West Himalayan Birch tree in dog years. In some countries they use birch tree sap as a substitute for sugar. Maybe their soft drinks are advertised as "high in tree products and low in sugar"
If you want to grow your own Multi-stemmed West Himalayan Birch Betula Jacquemontii then start with one about 50-100cm tall and cut the main leader down to around 30cm. The birch will send out new branches forming a multi-stemmed version which does not grow as tall as the single stemmed versions.